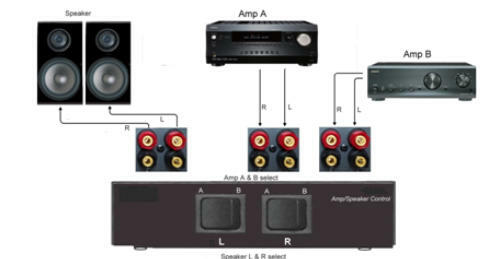 - Select between two audio amplifiers and a single pair of speakers - Share one pair of speakers between two amplifiers. and one pair of speakers. The sources can be selected via two audio switches on the front of the TC-7210. Ideal for multiple audio sources such as Valve amplifiers Integrated amplifiers AV amplifiers The TC-7210 is designed to provide a distortion free signal from your audio amplifier or Home Theatre System, to your speakers.